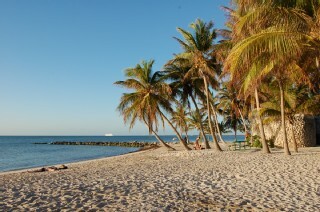 We offer the perfect Key West vacation rental package! Paradise awaits you at our luxury Key West vacation rentals on the ocean. Our accommodations are the perfect alternative to a hotel or tiny villa. Our condo rentals are part of the beautiful 1800 Atlantic resort condominiums complex and is located right on the beach. Why stay in a cramped cottage or bed and breakfast when you can stay at a luxurious spacious condo rental with a huge 1375 sq. feet of elegant space. Our condo rentals offers a great value compared to the hotels or inns, especially when you are able to share the cost with your friends or family. The vacation rental condos at the 1800 Atlantic resort offer spaciousness and all the comforts of home. 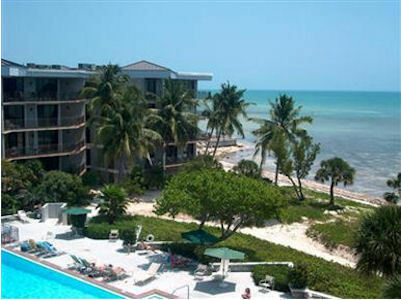 Luxury Key West Vacation Rental Condo on the Beach! The 1800 Atlantic resort is located right on the beach, next door to the largest and best beach on the island, Smathers Beach. The resort property is conveniently situated within easy walking distance to many of the islands most popular water activities. The 1800 ocean front resort property not only features one of the best locations in the Florida Keys, we feature first class resort amenities unmatched by any other of the island's resort properties or hotels. 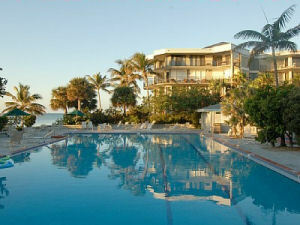 Our vacation rental property is licensed for Key West nightly vacation rentals with a three night minimum stay. If you're staying for a week or more we offer weekly vacation rental specials and discounts along with our monthly vacation rentals specials and discounts for longer stays. Click here to view our condo rental special offers page to see our current and latest vacation rental specials and discounts. Be sure to check back periodically for last minute condo rentals deals and vacation rental special offers. We are confident you'll never want to stay in a Key West hotel ever again after spending your vacation at our world class resort. After comparing the 1800 Atlantic beach front resort to the historic Duval Street hotels or tiny Old Town vacation rental properties we're confident that you'll agree our condo rentals offer the perfect location at a great value! You will also discover that the 1800 Atlantic resort offers one of the best and complete Key West vacation packages available. We invite you to be our guests and we look forward to having you stay at our ocean front condo rental on your next vacation to Florida! We have many repeat guests so be sure and sign up early to guarantee your reservation. Let our condo rental help insure you have the trip of a lifetime. Through our property management company we have over thirty condo rentals available to choose from at the 1800 Atlantic resort. Please fill out our vacation rental contact form if you wish to inquire about the available condo rental options. Click here to view the location of our 1800 Atlantic Luxury Vacation Rental - on the Beach. for the 1800 Atlantic Resort Properties.